For the history of the Korea before its division, see History of Korea. The History of South Korea formally begins with the establishment of South Korea in 1948. South Korea, known as one of the four tigers of Asia, has risen from the rubble of the Korean War into one of the world's foremost economies and vibrant democracies. That in the face of a foe bent on invading, at the first chance, just thirty miles from the capital city of Seoul. Emerging from a suffocating colonial rule by Japan for forty years, followed by a life and death war with North Korea, South Korea has shrugged off the collar of authoritarian rule to become a mature democracy during the past fifteen years. Surviving an economic collapse, in the 1990s, that required bailing out by the IMF, South Korea has diversified its economy and moved toward self-reliance. Although still requesting the presence of United States troops, South Korea is steadily moving toward full self-defense posture. While inaugurating a Sunshine policy in a climate of increasing tension from a nuclear-arming North Korea. Living in an environment of intense tension, South Korea has become a nation ready to take on the task of Reunification. In the aftermath of the Japanese occupation of Korea which ended with Japan's defeat in World War II in 1945, a United Nations arrangement divided Korea at the 38th parallel under the administration of the Soviet Union in the north and the United States in the south. While the Soviets refused to permit UN mandated elections in the North, the United States decided to go ahead with elections in the South. The United Nations declared South Korea the only legitimate government on the Korean Peninsula in 1948. DMZ between North and South Korea. South Korea's history has been marked by alternating periods of democratic and autocratic rule. Historians have conventionally numbered civilian governments from the First Republic of Syngman Rhee to the contemporary Sixth Republic. The First Republic, arguably democratic at its inception, became increasingly autocratic until its collapse in 1960. The Second Republic, strongly democratic, suffered an overthrown in less than a year, with an autocratic military regime taking power. The Third, Fourth, and Fifth Republics, while nominally democratic, have been widely regarded as the continuation of military rule. With the Sixth Republic, the country has gradually stabilized into a liberal democracy. Since its inception, South Korea has seen substantial development in education, economy, and culture. Since the 1960s, the country has developed from one of Asia's poorest to one of the top economies in the world. Education, particularly at the tertiary level, has expanded dramatically. Since the 1990s, Korean popular music, TV drama, and films have become popular throughout East and Southeast Asia, in a phenomenon known as "Korean wave." Russia and the United States arbitrarily divided Korea at the 38th parallel as forces advanced toward each at the end of World War II. Each power agreed to accept Japan's surrender in their section and bring stability to the nation. After Japan's surrender to the Allied Powers, marked the beginning of Soviet and U.S. trusteeship over the North and South, respectively. The Provisional Government of the Republic of Korea based in China claimed the legitimate right to govern, but both Russia and the United States rejected that claim. Korean elder and child, Anyang, South Korea. U.S. forces of the 24th Corps of the U.S. Tenth Army, landed at Incheon on September 8, 1945, establishing a military government shortly thereafter. Lt. General John R. Hodge, commanding the forces, took charge of the government. Political and economic chaos in the aftermath of World War II plagued the country. The after effects of the Japanese colonization left their mark in the South as well as the North. In addition, the U.S. military, largely unprepared for the challenge of administering the country, arriving with little knowledge of the language, culture, or political situation. Thus, many of their policies had unintended destabilizing effects. Waves of refugees from North Korea and returnees from abroad exacerbated the turmoil. The short-lived People's Republic of Korea had been established throughout Korea by Lyuh Woon-Hyung in August, after negotiation with Japanese invaders. Declared invalid by U.S. in the South shortly after U.S. arrival, Yeo stepped down and formed the Working People's Party. In November and December 1945, the United States provisional government returned members of cabinet of the Provisional Government, including President Kim Koo, to the status of private citizens. Faced with mounting popular discontent, in October 1945, Hodge established the Korean Advisory Council. A year later, the council established an interim legislature and interim government, headed by Kim Kyu-shik and Syngman Rhee respectively. Those interim bodies lacked any independent authority, nor de jure sovereignty, which the Provisional Government still held. 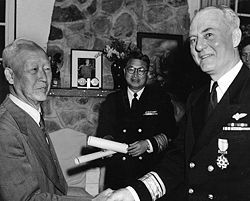 Syngman Rhee, Presents the ROK Order of Military Merit (Taiguk), to Rear Admiral Ralph A. Ofstie, USN. Photo is dated 13 May 1952. On August 15, 1948, popular elections formally established the Republic of Korea, with Syngman Rhee as the first president, elected the President ahead of Kim Koo in July 1948. With the establishment of Rhee's government, de jure sovereignty also passed into the new government. On September 9, 1948, the Soviet Union established Democratic People's Republic of Korea under Kim Il-Sung. The investiture of the Rhee government followed the general election of May 10, 1948. The first National Assembly promulgated the country's first constitution on July 17, establishing a system with a strong president elected indirectly by the National Assembly. While a government with ministerial responsibilities had been considered, opposition by a number of politicians seeking power prevented its application in favor of a Presidential Government. On December 12, 1948, by its resolution 195 in the Third General Assembly, the United Nations recognized the Republic of Korea as the sole legal government of Korea. During the period from 1945–1950, the United States and South Korean authorities carried out a land reform that retained the institution of private property. They confiscated and redistributed all land held by the Japanese colonial government, Japanese companies, and individual Japanese colonists. The Korean government carried out a reform obliging Koreans with large landholdings to divest most of their land. That created a new class of independent, family proprietors. The Korea Democratic Party, supported Rhee in the elections but neglected to include any of its members in his cabinet. In retaliation, the members of the party formed a united opposition Democratic Nationalist Party, advocating a cabinet system that would remove power from the president. That led to a regrouping of the Rhee faction into the Nationalist Party, which later became the Liberal Party, and remained Rhee's base throughout his administration. The country held the second parliamentary elections on May 30, 1950, and gave the majority of seats to independents. 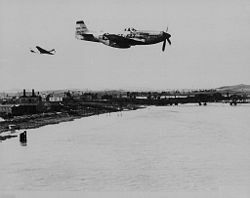 A pair of sleek, sturdy P-51 Mustangs over North Korea. The nationalist government continued many of the practices of the U.S. military government. That included the tight control of communist activity. The Rhee government used a heavy hand in military action against the Jeju uprising. Rhee's government also crushed military uprisings in Suncheon and Yeosu, ignited by orders to sail to Jeju and participate in the crackdown. Rhee sought to align his government strongly with America, and against both North Korea and Japan. The First Republic on North Korea, before and after the Korean War, maintained a policy of "unification by force." Although some talks advancing normalization of relations with Japan took place, they achieved little progress. The government accepted massive American aid, in amounts sometimes near the total size of the national budget. On June 25, 1950, North Korean forces invaded South Korea (Korean War). Led by the U.S., a sixteen member coalition undertook the first collective action under the United Nations Command (UNC). The North Koreans inflicted heavy civilian casualties and wrought immense destruction. With the People's Republic of China's entry on behalf of North Korea in 1951, the fighting stalemated close to the original line of demarcation. Armistice negotiations, initiated in July 1951, finally concluded on July 27, 1953, at Panmunjeom, situated in the Demilitarized Zone (DMZ). Following the armistice, the South Korean government returned to Seoul on the symbolic date of August 15, 1953. After the armistice, South Korea experienced political turmoil under years of autocratic leadership of Syngman Rhee, which ended with student revolt in 1960. Throughout his rule, Rhee sought to take additional steps to cement his control of government. Those began in 1952, when the government still based in Busan due to the ongoing war. In May of that year, Rhee pushed through constitutional amendments which made the presidency a directly-elected position. To do that, he declared martial law and jailed the members of parliament whom he expected to vote against it. Rhee subsequently won the election by a wide margin. He regained control of parliament in the 1954 elections, and thereupon pushed through an amendment to exempt himself from the eight-year term limit. The violent repression of a student demonstration in Masan on the day of the presidential election, March 15, touched off the events of 1960, known as the April Revolution. Initially local police quelled those protests, but they broke out again after protesters fron the body of a student floating in the harbor. Subsequently nonviolent protests spread to Seoul and throughout the country, and Rhee resigned on April 26. 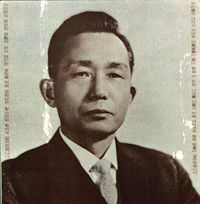 Poster showing head-and-shoulders portrait of Park Chung Hee. After the student revolution, an interim administration under Heo Jeong briefly held power. The nation held a new parliamentary election on July 29, 1960. The Democratic Party, which had been in the opposition during the First Republic, easily gained power and the Second Republic established. The revised constitution dictated the Second Republic to take the form of a parliamentary cabinet system where the President took only a nominal role. That constitutes the first and the only instance South Korea turned to a cabinet system instead of a presidential system. Yun Po Sun won election as the President on August 13, 1960. Chang Myon became the prime minister and head of government. The Second Republic saw a proliferation of political activity repressed under the Rhee regime. Much of that activity came from communist and student groups, which had been instrumental in the overthrow of the First Republic. Union membership and activity grew rapidly during the later months of 1960. Unions and students held around 2,000 demonstrations during the eight months of the Second Republic. Under pressure from the left, the Chang government carried out a series of purges of military and police officials who had been involved in anti-democratic activities or corruption. The government passed a Special Law to that effect on October 31, 1960, placing 40,000 people under investigation. The government purged more than 2,200 government officials and 4,000 police officers. 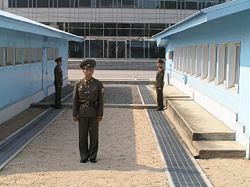 In addition, the government considered reducing the size of the army by 100,000, although shelving the plan in the end. In economic terms as well, the government faced mounting instability, formulating a five-year economic plan. A coup precluded action on the plan. The Second Republic saw the hwan lose half of its value against the dollar between fall 1960 and spring 1961. Unemployment and wholesale prices also rose during that period. A military coup d'état (5.16 coup d'état) led by Major General Park Chung Hee on May 16, 1961, put an effective end to the Second Republic. 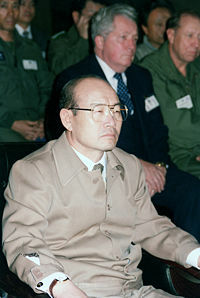 Park, one of a group of military leaders who had been pushing for the de-politicization of the military, felt dissatisfied with the cleanup measures undertaken by the Second Republic. Convinced that the current disoriented state would collapse into communism, they chose to take matters into their own hands. The military leaders promised to return the government to a democratic system as soon as possible. On December 2, 1962, the Korean people held a referendum on returning to a presidential system of rule, allegedly passing with a 78 percent majority. Park and the other military leaders pledged not to run for office in the next elections. Park ran for president anyway, winning narrowly in the election of 1963. 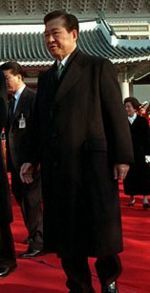 South Korean President Kim Dae-Jung. Park ran again in the election of 1967, taking 51.4 percent of the vote. At the time, the constitution limited the presidency to two terms, but a congressmen forced a constitutional amendment through the National Assembly, in 1969, to allow him to seek a third term. He won reelection in the 1971 presidential election. The leading opposition candidate, Kim Dae-jung, lost by a narrow margin. The Third Republic saw South Korea begin to take a more confident role in international relations, normalizing relations with Japan in an agreement ratified on August 14, 1965. The government continued its close ties with the United States, and continued to receive large amounts of aid. A status of forces agreement was concluded in 1965, clarifying the legal situation of the U.S. forces stationed there. Soon thereafter, Korea joined the Vietnam War, eventually sending a total of 300,000 soldiers to fight alongside U.S. and South Vietnamese troops. The economy grew rapidly during that period. The Park regime used the influx of foreign aid from Japan and the United States to provide loans to export businesses at negative interest. The government also supported the construction of the POSCO steel mill, which came online early in the Fourth Republic. On December 6, 1971, Park declared a state of national emergency. On July 4 of the following year, he announced plans for reunification in a joint communique with North Korea. Park declared martial law on October 17, 1972, dissolving the National Assembly. He also announced plans to eliminate the popular election of the president. The Fourth Republic began with the adoption of the Yusin Constitution on November 21, 1972. That new constitution gave Park effective control over the parliament. In the face of continuing popular unrest, Park promulgated emergency decrees in 1974 and 1975, which led to the jailing of hundreds of dissidents. This period also saw continued dramatic economic growth. Korean President Chun Doo-hwan attends a briefing given be Major General (MGEN) Claude M. Kicklighter. After the assassination of Park Chung Hee by Kim Jae-kyu in 1979, a vocal civil society emerged that led to strong protests against authoritarian rule. Composed primarily of university students and labor unions, protests reached a climax after Major General Chun Doo-hwan's 1979 Coup d'état of December Twelfth and declaration of martial law. On May 18, 1980, a confrontation in the city of Gwangju between students of Chonnam National University protesting against the closure of their university and armed forces turned into a citywide riot that lasted nine days. Immediate estimates of the civilian death toll ranged from a few dozen to 2000, with a later full investigation by the civilian government finding 207 deaths (Gwangju Massacre). Public outrage over the killings consolidated nationwide support for democracy, paving the road for the first democratic elections in 1987. In 1987, Roh Tae-woo, one of Chun's colleagues in the 1979 coup, and a member of Hanahoi, won the election to the presidency by popular vote. 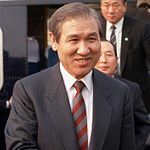 In 1992, Kim Young-sam won the presidential election, the country's first civilian president in thirty years. In 1997, the nation suffered a severe financial crisis, but made a solid recovery. South Korea has also maintained its commitment to democratize its political processes, as Kim Dae-jung won the presidency in the same year. That represented the first transfer of the government between parties by peaceful means. Kim Dae-jung pursued the "Sunshine policy," a series of efforts to reconcile with North Korea, culminating in the summit talk with North Korean leader Kim Jong-il. Kim Dae-jung received a Nobel Peace Prize, in 2000, for his peace initiative. The efficacy of the Sunshine Policy came into question amid allegations of corruption. 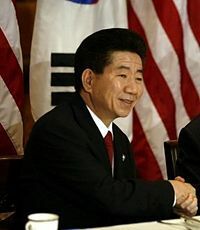 Noh Moo-hyun won election to the presidency in 2002. On March 12, 2004, the South Korean National Assembly (Parliament) voted to impeach President Noh Moo-hyun on charges of corruption and political patronage. The Uri Party, which solely supported the President, angrily boycotted the vote. That motion clearly affected the outcome of the parliamentary election held on April 15, 2004, in which the Uri Party won 152 seats from the total of 299 seats in the National Assembly. For the first time in eighteen years the ruling party became the majority in the House. That arguably represents the first time in more than forty years that a liberal party had held a majority in the Assembly. The Uri Party lost its majority in by-elections in 2005. ↑ Cumings (1997), p. 189. ↑ Lee (1984), p. 374. ↑ Nahm, Cumings, loc. cit. ↑ Nahm (1996), p. 351. ↑ Nahm (1996), p. 340. ↑ Lee (1984), p. 375. ↑ Nahm (1996), p. 330–332. ↑ Yang (1999), p. 124. ↑ Cumings (1997), p. 221. ↑ Yang (1999), p. 194-195. ↑ Yang (1999), p. 193. ↑ Yang (1999), p. 194. ↑ Cumings (1997), p. 255, 306. ↑ Yonhap (2004), p. 270. ↑ Yang (1999), p. 196. ↑ Nahm (1996), p. 411. ↑ Nahm (1996), p. 412. ↑ Yonhap (2004), p. 271. ↑ Nahm (1996), p. 423. ↑ Nahm (1996), p. 424. ↑ Cumings (1997), p. 320. ↑ Nahm (1996), p. 425. Korea Annual 2004. 2004. Seoul: Yonhap News Agency. Nahm, Andrew C. 1988. 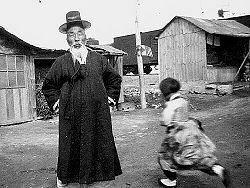 Korea: Tradition & Transformation: A History of the Korean People. Elizabeth, N.J.: Hollym International Corp. ISBN 9780930878566. Yang, Sŏng-chʻŏl. 1994. The North and South Korean Political Systems: A Comparative Analysis. Boulder, Colo: Westview Press. ISBN 9780813388625. Yi, Ki-baek. 1984. A New History of Korea. Cambridge, Mass: Harvard University Press. ISBN 9780674615755. History of "History of South Korea"
This page was last modified on 10 January 2018, at 15:21.